As I say the prayer to St. Rita, I like to reflect on certain excerpts and really focus in on the meaning. The language on the card that I found is not common today, so I like to "translate" it, so to speak, and reflect on the meaning it has in my life. I would encourage you to do the same. always trust that St. Rita is by my side, holding my hand and guiding me through. I can only make these changes myself. because I trust in her, through Jesus Christ. is impossible if we put our full trust in the Lord and St. Rita. who die of cancer didn't pray hard enough, or if it was just God's will. I'm not sure that a person can pray a person "well." for a sick person we should really be praying for St. Rita to send that person strength and courage during their time of need. in so much positive energy that she was able to get stronger and stronger? Possibly. if we pray to St. Rita they will be given at least comfort, if not relief. follow her example of divine love, patience and devotion to God. connect with her and ask her for guidance. I ask her to hold my hand as I approach things in life that may seem "impossible." known thy favor, to bless and sing they praises forever." My reflections in this website are my way of "making known her favors"
and singing her praises forever! When I first started praying to St. Rita, I started noticing that so many things that seemed "Impossible" were coming true in my life. When I found the prayer card, my life was in such turmoil that I didn't even know where to begin to make changes. A lot of the things that were "wrong" in my life were out of my hands, for example I was in a property that had negative equity and it seemed as though I couldn't "get out." I prayed and prayed and here I am today, nearly 3 years later with the matter resolved in a way that worked out fairly for all parties involved. That is just one example of the things that have changed in my life since I started saying this prayer. As time went by and I started really seeing the changes in my life, I began to tell others about the prayer and give out copies. Now, don't get me wrong, I do not believe in imposing my religious beliefs on other people. I do not even technically believe in any one religion. However, I had personally experienced so many miracles in my life since I began saying this prayer that I was very excited to tell other people about it and share the beauty of St. Rita with them. At one point, while reciting the portion of the prayer that states "We promise, if our petition is granted, to glorify thee by making known thy favor, to bless and sing thy praises forever", I decided that I was going to create a website to "make thy favor known." Hence, this site that you are visiting right now. My hope is that you will pass this prayer along to others who need the guidance of St. Rita and they will pass it along to others as well. Maybe it will reach a person who really needs a big miracle and St. Rita will intervene for them as well and THEY will then sing her praises and "make known thy favor." My prayer is that this has a ripple effect to reach many, many people and change their lives. My prayer tonight is for YOU and that whatever you may feel is impossible in your life that you will know that St. Rita can make it happen. Sometimes it may require a great deal of effort on your part as well, and maybe you're just not motivated enough to do something for yourself. Tonight I pray for YOU that you may seek and believe the prayer to St. Rita and allow your "impossible" situation to be resolved. Most of us have at least one person in our lives, usually in our family, in which we have a strained relationship. There may be arguing, etc. and it gets to a point where you just may give up. I had gotten to a point of giving up on my relationship with a family member. I had tried many different avenues of trying to get along with this person for over 30 years and nothing seemed to work. I finally decided to pray to St. Rita about it. Almost overnight I saw a big change. This was several months ago and I still continue to see the relationship grow and improve! I NEVER thought this would be possible! So I will continue to pray to St. Rita every day to help us to improve our relationship. I am seeing it happen a little at a time. I would like to encourage you to do the same in your relationships. If you are in a relationship that could be a wonderful thing but it is being held back by petty things, pray to St. Rita because she will work on BOTH people in the relationship to make changes happen. Don't be afraid to pray to her and ask for help in relationships. But take a look at yourself as well and be open to the changes that she will also make in YOU. Lately I've been coming across things with St. Rita on them more and more. It makes me feel like she is with me and gives me a sign that she hears my prayers. Last week while I was at work I went to the door and noticed a van parked across the street that had a big sign on it that read "St. Rita of Cascia." There is a school about 8 miles away from my office that is called St. Rita, but I have never heard of it being called St. Rita of Cascia, nor have I seen it written that way on their vans until that day. It gave me a sense of peace that St. Rita is with me and hearing my prayers and making "the impossible" very possible in my every day life. I also find myself just looking at her picture and trying to imagine her as a real woman, just like me. She had real problems, just like me. And sometimes I feel like I'm praying to this mystical force and then I remember that she was a person, just like me. I like to look at the pictures of her so I can feel like I'm talking directly to her. I love to pray to her for comfort. Nothing happens overnight,especially not anything that we deem to be "impossible." Whenever I say the prayer to St. Rita, I always feel comforted right away because I just know in my heart that she is there. I feel like she is my guardian angel and she is helping me to strengthen my Faith and my relationship with God. She is helping me to put things in God's hands. I notice that in most of her pictures she is holding a cross and looking at Jesus in admiration. It reminds me of her devotion to Jesus and how Holy she was during her life. I am reminded that it was her deep Faith and devotion that allowed the things that seemed "impossible" in her life. It encourages me to keep my Faith strong. Here is another picture of St. Rita, look at her either before or after you pray and remember, she was also human just like you and me. I want to reflect on praying for other people. So often we get so caught up in our own problems, in our own worries and things that we feel are impossible and we don't stop to think about how good we have it. I can think of so many people in my life that need prayer. When you say the prayer to St. Rita for the Impossible, remember to pray for other people as well. When I stop and think about it, I can name at least 10 people who have more problems than I do at this very moment. Most of them have health problems. I'm not quite 40 years old, but just this past year I've been realizing how much I have taken my health for granted. Tonight I visited a friend's dad and he has cancer. He has lost 80 lbs in 1 year and I can hardly recognize him. It was so sad to see a man that was once so vibrant seem so frail. My friend and her family are under so much stress with his illness. They have always been such a happy family but now they seem like they have given up hope that he will survive the cancer treatment. After all, he is nearly 80 years old and very frail. Tonight I pray that they don't give up and that they always have hope. Tonight I pray to St. Rita for my friend's family and thank God for my health. Without good health you have no life. I'm praying tonight that my friend's dad gets his health back. Though it may seem impossible, anything is possible. If it's his time to pass then I pray that St. Rita bring comfort to my friend's family. Amen. This week when I was looking at the card that I found, I decided to read the story of St. Rita again. I came across a prayer that she used to say "O loving Jesus, increase my patience according as my sufferings increase." Instead of feeling sorry for herself or complaining as her suffering increased, she prayed to Jesus to help her increase her patience and that has stuck with me this week. Like many people, I am very impatient. I want everything done yesterday and patience is one of my biggest challenges. I'm not quite where I want to be in my life, yet I'm 1,000 miles further in my progress than I was a year ago. Things may change or happen very slowly in our lives and it is a challenge to not feel sorry for ourselves and instead pray to God for strength and patience when our suffering increases. For example, if you or somebody you know are lonely and you feel like you are suffering, you can ask God to have patience and ask God to help you to make lemonade out of lemons and pray to St. Rita for strength and patience. It's hard to not feel sorry for ourselves, but it will never solve anything. Praying to St. Rita and God for strength and patience will help us to grow. The story of St. Rita is so inspirational to me. Sometimes I like to review the story of her life and it inspires me to try to be more like St. Rita in my relationship with God. She fully trusted God and prayed to Jesus for increased patience instead of self pity. That has inspired me to get through a very tough week. I pray that you may also have patience and strength. Amen. A wise woman once said "We are anointed for hard." Nothing worthwhile comes easy. Most of us have things in our lives that are hard. Whether its addiction, staying motivated, raising children, staying positive and even working on our relationships it can be really hard. God knows that these things are hard and He is here to help us if we only ask. When I think about us being anointed for hard, I often think of St. Rita. She lived through so many hard things. But she always obeyed God. It can be so difficult to do the right thing and follow God's word and obey God. 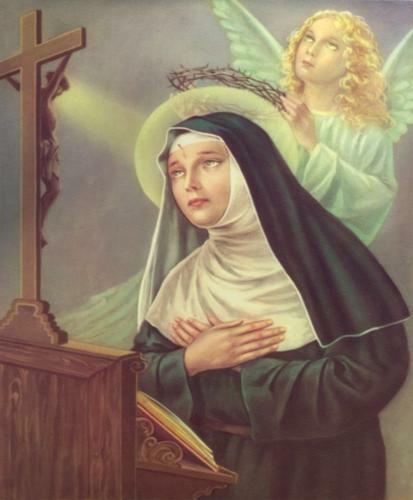 I look to St. Rita for inspiration in this area because she wasn't necessarily perfect, as no human is without fault. But she never let the fact that something was "hard" stand in her way. She just did it. She followed her heart and she followed God and she just did what she knew that she had to do to get to where she wanted to be according to God's plan for her. I pray tonight that we may all follow the example of St. Rita when it comes to doing something that's hard. I pray that we don't dwell on the difficulty of the matter but rather find joy in knowing that we are obeying God. Today I lost a family member and I have been saying the prayer to St. Rita for her for over a year. This is the woman that I mentioned on the "Praying and Faith" portion of this reflection page. She had survived breast cancer and lung cancer over the past few years and almost a year ago this month she was on life support and wasn't supposed to make it through the weekend. 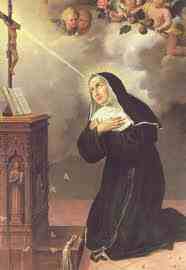 I said the prayer to St. Rita for her along with many other family members saying prayers for her and she bounced back. Nobody could believe it! They referred to her as a Super Woman! Over the course of this past year I could tell that she was hanging on for many events in the lives of her children and her grandchildren. She made it to her daughter's baby shower in February, she made it to see her 6th grandchild born. Nobody could believe she lasted that long. Then she made it to see my nephew graduate in June. She was frail, but she was there. Then she made it to my niece's birthday just a few weeks ago, again very frail but there. Finally her youngest daughter got married last night and she made it to that as well. Then she died peacefully this morning, nearly a year after she wasn't expected to live for a weekend. I usually keep her in my prayers every night when I pray to St. Rita. Tonight I am praying for her family. She is at peace. We all must be reunited with God one day, but I do believe that this special lady, through the power of will and prayer, proved the impossible! It is hard to lose somebody that we are close to, especially when we pray for their life. But we all must pass, we must be reunited with our creator and when that happens I find peace in praying to St. Rita that the person who passed is in God's arms and in heaven and that God is holding that person's family closer than ever. Though I don't affiliate myself with any one religion, I have always considered myself a Christian. I attended a Christian service today and the message focused on Moses and how he was called by God to free his people. He was just one person. He was a sinner. He was insecure. He did not believe that he could change the world. The message today was to focus on what each of us as people can bring to the table to do for God. Maybe we weren't cut out to lead millions of people. Maybe it's not in our calling to lead a ministry. But if there is something that you feel that God is calling you to do and you just don't know HOW you're going to do it, pray to St. Rita to show you the way. Every person on earth can contribute to change. We all have the ability to make another person's life richer through God. Some people donate time to charity, others offer support to people who are in need. Today I was challenged to discover what God wants me to do to help to change the world. What can I do? My hope is that this website brings hope and peace to those in need and helps to spread the prayer to St. Rita. I want people to know that through St. Rita and God, nothing is impossible. I was challenged to ponder the question "What would I do for God if I were guaranteed that I would not fail?" That's a tough question to answer. I am praying to St. Rita to give me the answer and I would like for you to reflect on that question as well. Everything that we do has a ripple effect. We may be contributing to change in the world in small ways, but every good deed makes a big difference. So when you pray to St. Rita, ask her "What Can I Do?" and she will give you the answer. God will give you the strength to follow through on that answer and together we CAN change the world. Last week we celebrated Thanksgiving and I would like to reflect on praying to St. Rita and gratitude. Often it is hard for me to remember everything that St. Rita has done for me. I always remember the big things, the miracles that happened that otherwise seemed impossible. I try to thank St. Rita on a regular basis and I think that it is important to always be grateful for all that God and St. Rita have done for us, whether big or small. Many times I pray to St. Rita for "little" things. She has always answered my prayers. On several occasions I have prayed to her for something to go "my way" that otherwise seemed impossible and I didn't get the answer that I was looking for in my prayer. Yet I am still thankful that she put it in my heart that what I was praying for just wasn't meant to be. This is where she brings comfort. I am so thankful that I found the prayer card to St. Rita and I am so very grateful for all of the miracles, whether big or small, that have happened in my life because of St. Rita. We should take more time to be thankful. As Americans we set aside a day called "Thanksgiving" to reflect on all that we are thankful for in our lives. We need to express gratitude to God and St. Rita throughout the year. We need to notice the "little things" that happen for us on ordinary days. We need to emphasize our gratitude in prayer more often than we emphasize our needs. I am grateful for so many things in my life that I could not possibly list all of them. Doesn't it feel great when you do something nice for somebody and they thank you? Let us always thank God and St. Rita for all of the gifts that we have in our lives. Tonight I would like to reflect on happiness. I can remember when I first found the prayer card to St. Rita. At that time I was in a really bad place in my life. I didn't think that things could get any worse. I needed so many miracles I didn't even know where to start. I can't say that I was very happy at that point in my life. But I can today. I'm not where I want to be, but I'm 1,000 miles further than I was when I found this card. We all have goals and dreams and tend to think we'll be happy when we "get here." Then we get there and we're still not happy. I can remember even in my darkest days always finding something to be happy about. When I look back to the time when I found the card and nearly 5 years later after St. Rita has helped me through so many situations, I can honestly say I'm happy. I'm very, very happy. Nearly everything that I needed St. Rita to do for me has happened. Yes, I've worked hard for most of it. However I am convinced that St. Rita has shown me that there is no such thing as "impossible." I think God wants to see us happy, regardless of situations in our lives. I am a very blessed and lucky woman. Every day of my life I look at where I was and where I'm at now and I realize how happy I am. Some people would be depressed if they lived in my shoes. I live in a small house, I have a used car that seems to always need work, I don't have fancy jewelry, I don't have a boyfriend or a husband nor kids, I don't go on expensive vacations and I don't buy expensive things. So why am I so happy? I'm happy because I'm content with all that I DO have in my life. I have a car that's old but it runs. I live in a small 1 bedroom house, but it's cozy and I love it! I have my dog, everybody in my family is healthy, I have enough money to buy everything that I need at the store, I finally have a little bit of money saved, I have awesome friends that are super funny, I've rebuilt my company and I believe that the husband and children will come when God thinks I'm ready. So reflect on what YOU are happy about. Thank God and thank St. Rita and be HAPPY! My dad was diagnosed with cancer in February of this year (2013). When he was diagnosed I gave him a copy of this prayer. I did not tell him that I created this website. A few months later we found out that his cancer had spread and he was very disappointed. He told me that he had been doing everything that he could and he was praying to St. Rita. He passed a few weeks ago (In August of 2013), but I refuse to say that he lost his battle with cancer because in many ways, he won. He had nearly 20 tumors in his body and he still went out golfing after going to chemo. He had all of the doctors in awe that he was able to keep living with cancer throughout his body. Yes, he did pass away, but God calls all of us home when it's our time. Of course the past few weeks have been very difficult for me, but I still pray to St. Rita every day. I need her help more now than ever. I need her to comfort me and my family and all of my dad's friends that really miss him. I need to know that she is with me and he is still with me as well. I keep seeing things that remind me of my dad and getting little signs that he is with me, which brings me great comfort. But I've been getting signs from St. Rita as well. I saw a "St. Rita" sticker on a car in the mall parking lot and I just happened to stop in at my sister's house last week only to find my niece wearing a "St. Rita" T-shirt! When I asked her where she got the shirt she stated that she got it from a math competition that she was in at St. Rita High School which is about 20 miles away. What made her wear the shirt that day? Was it a coincidence that she had it on when I happened to come by? One can only wonder, but to me I feel that these are little signs that St. Rita is with me. I hope my dad sees this site now too and he knows that St. Rita helped him too! Most of the time when I say the prayer to St. Rita, I state my intentions and ask Her to help me or another person with a problem. Many times I do remember to thank Her. But sometimes I'll simply pray for strength. I won't name a specific thing that I'm praying for, nor a specific person but only strength. Strength to get through a certain situation, strength to make some changes in my life, or strength to support a friend or loved one who may need my help. Sometimes we need to remember that we don't need to pray to God or St. Rita and name a specific "favor" that we want. I know people that keep "prayer lists" that usually include the names of sick people or people that are dying. I'm not saying there is anything wrong with that, but sometimes we need to just keep it simple and ask God and St. Rita to give strength to us and those in our lives that need it most.